So here's the thing: as I've mentioned before, anthologies kind of weird me out with their haphazardness, and this one's no exception. Reading it is like going on one of those bottom-drops-out amusement park rides, sending your stomach plummeting down into your socks (which feels icky) at times, then rocketing that very same stomach into the stratosphere far above your head (which feels great!). This simile is kind of getting away from me here, but suffice it to say that unbridgeable chasms in genre, writing quality, and story umph factor leave the hapless reader's head spinning. Would I prefer a collection of stories distinguished only by its bland, consistent mediocrity? No...but I would've been perfectly fine with an anthology limited to a single genre (sci fi, for example, perhaps with close cousins fantasy and horror in the mix too). Within such an anthology, the quality of the writing and stories probably still would've varied enormously, but at least it would all be within the parameters of a vague, loosely defined, poorly understood genre! Anyway, when this hit or miss collection hits, it freakin' hits, and when it misses, it misses by mega-miles. One very solid hit which caught me by surprise was Brandon Sanderson's offering. With only the flimsiest circumstantial evidence (Sanderson writes a lot of fantasy books), I had decided that Neal Stephenson was poking fun at Sanderson via the character Skeletor in Reamde, a man who writes prodigious amounts of totally forgettable fantasy literature, and consequently was prepared to dismiss this short story, the first thing I'd ever read by him, at the slightest provocation. Instead, all my haughty preparations were for naught, as I found myself flummoxed by an excellent story, one of the best in the entire book. Speaking of the best (and most memorable, thanks to the primacy effect! ), Joe Abercrombie's offering, following an hour in the eventful life of the not totally accurately named Shy, is positively delightful. It's a nonstop barrage of Abercrombie's characteristic bleak situations+wry humor one-two punch, and it's a knockout, as is the endlessly resourceful protagonist, who will be familiar to fans of Abercrombie's latest gem, Red Country. It's so good, in fact, that it creates rather high expectations for the rest of the book, specifically the expectation that a) all the stories will be, if not as good, at least good enough, b) all the heroines will be, if not as cool as Shy, at least cool enough, and c) the rest of the stories will be, if not fantasies, at least close enough...none of which is quite true, sadly. I found myself recalling John Cusack's voiceover from High Fidelity, explaining the art of making a mix tape, and disagreeing with him: sure, you want to start off strong, and naturally it makes sense to pull back a bit on subsequent songs—you don't want to stack the deck with all your aces on top and nothing but comparative crap after them—but there's no reason to make the contrast within the mix tape/deck of cards quite so...extreme. Several stories are barely even fictitious! (The nerve of the writers, to think we readers want or expect history, when all the world knows we want stories that let us escape all that nastiness!) In fact, even the much vaunted George R.R. Martin, while exciting enough, is framed as a dry history, and as a consequence is just okay. One about What's Her Name, wife of Emperor Whosit, was particularly jarring, because for the life of me I wasn't sensing anything the least bit 'dangerous' about her, and the same worry had evidently occurred to the author, who noted that What's Her Name might have been involved in a conspiracy against Whosit later. So why didn't said author write that speculative story, instead of sticking to such an unimpressive episode in What's Her Name's life? Sure, she was in danger the whole time, but it's not like she led a charge of knights to smite the evildoers or whatever. 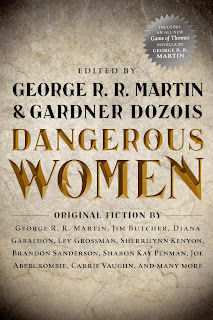 And if I'd wanted a book about women in danger who need to be rescued by (of course) men, I could've just read any of the vast majority of standard fantasy stories, or any of a fair selection of sci fi. No need to get my hands filthy 'gathering flowers' (anthologizing) for that! What I'm saying is, I have yet to find that rarest of creations, an anthology whose stories interact with each other, and are consistent enough in quality if not in content that the anthologized whole is greater than the sum of its parts. It's a shame I can't rate each individual story, but that would take forever—there are like a bajillion (to quote one of my other least favorite stories, about a conspiracy at a nursing home to help old people fight dementia with over the counter drugs—pure evil, and plenty dangerous too, right?) of them. So I decided I'd review the anthology qua (a fancy-pants Latin word for 'as', because why just say 'as' when you could say 'qua' instead!) anthology. 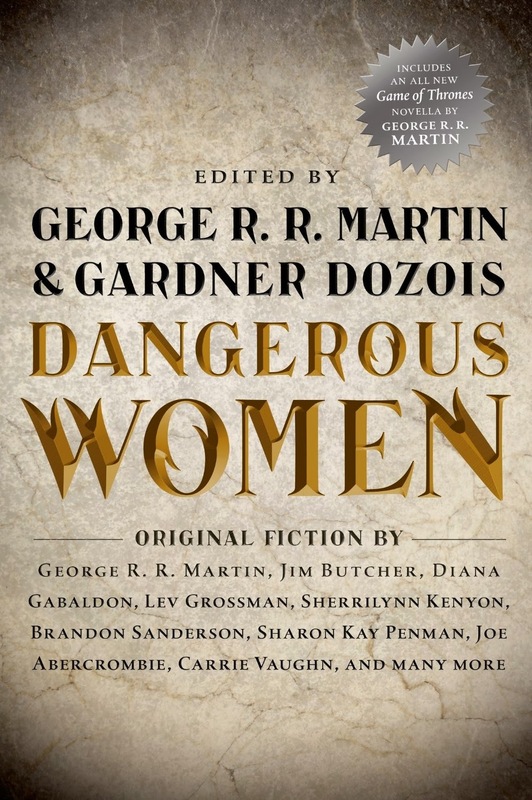 I think I have sufficiently disclaimed now: some stories in this collection are far better than the numerical rating below might indicate, and some far worse. In a way, having to assign a number value to a complex jumble of highly disparate stories perfectly reflects the essential lameness of anthologies, doesn't it? Penalties: -1 for stunning unevenness in genre, over and above what one might expect of any anthology (I guess dangerous women isn't enough of a unifying theme/idea on which to assemble a collection), -1 for crappy, only quasi-fictitious stories totally not about dangerous women, and plus the book is like 700 whatever pages long—the editors easily could've cut a few of the lamest ones! Nerd coefficient: 5/10 "equal parts good and bad"